Bake the Polka Dot Cheesecake! 1. Place your oven rack at a low position and pre-heat the oven to 350 degrees. 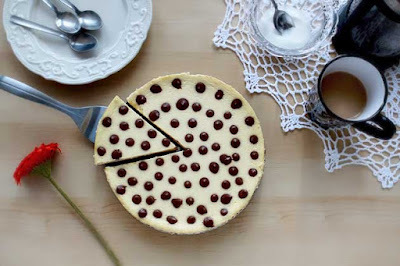 Grease a spring form cheesecake baking tin. Make sure you grease it well. Also, take out a large pan, which fits inside the oven and is not deeper than the baking tin. Set these things aside. 2. Melt the chocolate on top of a saucepan which has simmering water and let it cool once melted well. 3. Take a large container and beat cheese using the electric mixer or whisk. Make sure it is smooth and a little thick. Now beat in vanilla and almond essence or extracts and add in sugar slowly. Gradually add one egg at a time and continue beating this mix. 4. Remove 2 cups of the batter in the electric whisk and add the chocolate to it and blend it well. 5. Use non-stick spray in the baking tin and pour the light coloured mixture in it. 6. Using a pastry bag, put in the chocolate mix inside. 7. Place the cake on a proper heighted table and remove the cuff of the pastry bag. Make small round circle into the cake and make sure it is of an appropriate size. Let this ball be in the centre of the batter and add some smaller ones on the sides. Do one at a time and go slow. Make sure you make the shape well since this is the main attraction of the cake. The balls shouldn’t touch each other at all. 8. Now place the cake in the oven slowly so the batter doesn’t move around and spoil shapes. Place the larger pan below the tin and put hot water in it. 9. Bake this for about 1 and a half hours. Once the cake becomes golden brown and you feel it is dry and soft, take it out. 10. Let the cake cool for 3 hour at room temperature. 11. Make sure you cover the baking tin with plastic wrap so it doesn’t become dry while cooling. Put it on a plate upside down if you are not using a spring form tin. 12. Sprinkle graham crackers on the bottom of the cake. Make sure you are doing the step slowly and carefully. Press in the crackers so that they settle in. Turn the cake and refrigerate overnight. Make sure it holds the crackers well by the next morning. Well, that’s all and your cake is done! Chocolate, orange, almond Simnel cake!